Your experience starts in Miami's vibrant Little Havana at the Agustin Gainza Gallery. To ensure you get the most enjoyment possible, your hosts, Agustin & Esther Gainza, will close the business during your painting session to ensure exclusivity. Mr Gainza is a celebrated Cuban artist who will share his influence and introduce you to the unique Gouache style of painting you'll achieve today. Your guide and your co-host will continue to engage you with history of the artist and the gallery. Enjoy refreshing Cuban-style sangrias during your session and relax while your guide does the photography for you. When you've finished your masterpiece, enjoy social time with your hosts and fellow visitors while you're treated to a selection home-cooked appetizers and finger foods. You'll have the option to pose with your works and you will receive a gift with a unique, limited series and witness its signing before exploring the neighborhood. Arrival at the Agustin Gainza Gallery for a 4pm start. There is no transportation provided to or from this location. Your tour guide will, alongside your hosts, Mr & Mrs Gainza, introduce you to the artist and his personal history, the story of how the gallery came to be, and the unique painting style you'll be achieving. 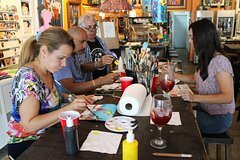 You will receive Cuban-style sangria or suitable alternate non-alcoholic refreshments while you are taken through the stages of painting your rendition of the subject selected specifically for your session. The gallery will be closed to the public for the hour of your painting session. You will enjoy some social time with your hosts and with your fellow travel enthusiasts while enjoying a selection of home-cooked appetizers and finger foods. Your painting will also appreciate this time to dry for handling or transport during this pause in the action. You will have opportunity to pose for a unique photo with the artist and, at an appropriate pause, you will receive your limited series gift. You will have opportunity to depart the gallery and, with your guide, explore highlights of the vibrant Calle Ocho section of Little Havana. Learn some local history, gain an insight into the Miami-Cuban culture, and even find recommendations to continue your own exploration later. Your guide will take photographs at various times during the session and such photography will be made available to you for download without additional cost.